Land reforms! NO Steakholder Conferences! 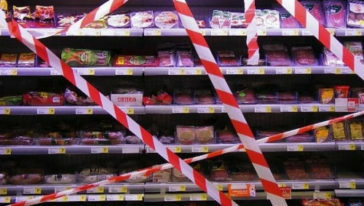 Amsterdam – On the 9th of December (2008) A SEED Europe held a picket-line at a conference on genetically modified soy. The objective of the meeting was to discuss sustainability risks and benefits of GM soy and to formulate management options for companies. A SEED reminded participants upon arrival that not only is GM still controversial, but so is large-scale soy production in general. A SEED did not participate in the conference itself because the announcement made clear that in our eyes crucial poignant issues in the (GM) soy debate were not open for discussion. The nature protection organisation WWF and the Dutch development organisation Solidaridad are still continuing with the Round Table on Responsible Soy. This is not as positive as it sounds. 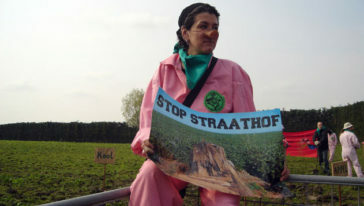 Tuesday 19 May, 2009 – Today, the head office of WWF-Netherlands received some extraordinary visitors, including a weeping panda, a Monsanto circus director, and various people in white overalls spraying "Roundup". The action is a protest on the occasion of the upcoming vote of the Round Table on Responsible Soy (RTRS), on 28 May in Campinas (Brazil). This forum will allow GM RoundupReady soy to be certified as 'responsible', while in reality, this soy is responsible for massive use of pesticides as well as deforestation and driving small farmers from their lands. This page offers a short report of every stop that we made on the pig tour that A SEED organised in June 2009. A report in German can be found on the website of Nandu, our German partner in this project. Later, we will publish a more substantial analysis on this website of what we experienced and saw during the many visits we paid to local action groups that are protesting against the pig farms. We can also get cracking with the new video-letters concerning the situation here in Europe: there’s plenty to do! Keep an eye on A SEED’s website for updates on the campaign against huge farms. In the past months A SEED has been active within the climate action movement. We saw this as a side step of our agriculture and soy campaign. Agriculture, and particularly meat production and live stock farming has huge impact on climate change. On the other side are small farmers in many Southern countries among the first groups that are negatively affected by the effects of climate change. In the months before and during the UN Climate Summit (COP15) in Copenhagen there has been a lot of attention for the issue. It was A SEEDs goals to get make agriculture part of the radical climate discourse. We have done this by publishing texts, organising actions and by being actively involved in the international mobilisation for the summit.